As much as I love casually whipping up an 8 course meal at the end of a busy day, in full make-up and evening gown, naturally, sometimes as the sun is sinking and the wee ones are off to bed the very last thing you can think of is cooking. The very first thing you think of, however, is wine. Well, it’s been a long 8.5 months, my old friend, but soon we shall re-acquaint. I’m certainly not anti having a glass of wine during pregnancy, but I personally cannot stomach it as the acid, oh, the acid, I experience is greater than the desire for the fruit of the vine….anyway, I digress. Pour yourself a wine, love. You’ve had a long day, and this simple little meal can be thrown together before you finish that glass and pour yourself another inch, or two….or, who’s counting anyway? 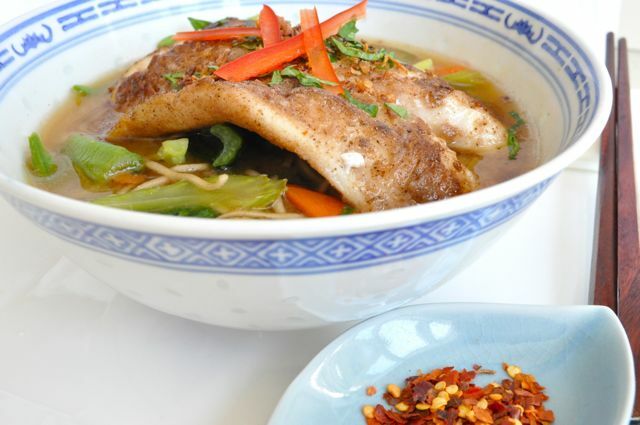 This five spice fish with miso soup is the perfect dinner when you can’t be arsed. I’ve used snapper in this instance, but any white fish will work. I’ve not tried it with salmon, but to be honest, I can’t see why it wouldn’t work. I recently even fed this to D Man. He loved the miso soaked soba noodles and vegetables and devoured the fish. I didn’t let him tackle the broth, however, the floor is too far beyond this monstrous belly at present to want to clean it up! I always have white miso paste in my fridge. It’s super handy and tasty for all sorts of things – marinades, sauces, and soups – and it’s good for you. Win/win. We can chat more about miso at a later date. Oh, I can regale you with tales of miso…..
Soba noodles are a Japanese noodle made from buckwheat. They’re also another staple in my cupboard. Stick with me and I’ll dazzle you with my soba noodle salad one day, I’m sure. They can be found in the Asian aisle of your friendly supermarket, or at an Asian grocer. For the vegetables in this, use what you have. If you don’t have what I’ve listed in the recipe, just make it up. Cabbage is good, beans are good, cauliflower would work, spring onions? Sure. This is an easy throw together meal. So, ready for dinner? Let’s rock. 1 teaspoon black pepper, use white if you have it. I love cooking with white pepper. 1 chilli, chopped, if you dig chilli. If not, omit. 1 carrot, cut into sticks or whatever shape makes you happy. a bunch of Asian greens. I like gai larn AKA Chinese broccoli. I think bok choy is boring but it’s a personal thing. So, you combine the flour, salt and pepper and spice on a plate. Taste it. Does it taste balanced to you? Play with it if you need to. Flap your fish around in it until it’s coated. Pop a pot on the stove with your water in it, add garlic, stock powder, and chilli. Set that to infuse. Get your fish pan on a medium high heat, and heat a little bit of oil. Throw your sturdy vegetables into the pot, broccoli, carrot, capsicum. Chuck your fish in the pan and keep an eye on it. Add the rest of the vegetables to soup and pop in your soba noodles. They need three minutes only to soften by which time your veges should be cooked lightly but retain a little crunch. Turn the heat off your broth. Turn your fish, take care not to overcook it, and stir your miso paste into your soup. 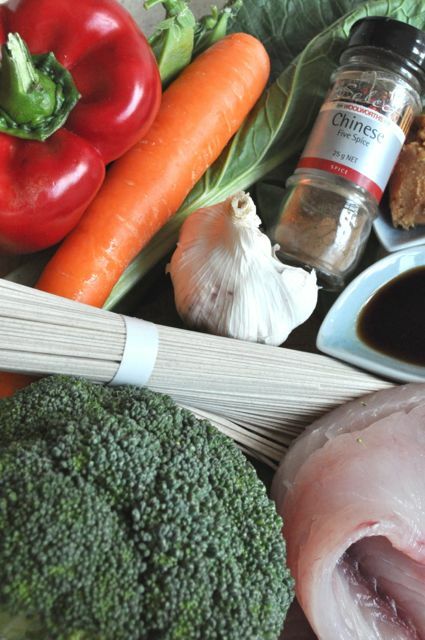 Rest your fish as you spoon your broth into the bowl, place fish on top, garnish with coriander and fried onions. Pour yourself that inch. Enjoy, my friends. This is my kind of comfort food. Sounds great but what about a good curry? Hi Uncle Mike! I’m trying to break everyone in gently with quick meals, but I could probably pull out the ol’ family fave of Savoury Mince? hey babe…..reading your blog while hung over in bed at midday….fun way to spend the day!!! Hey are soba noodles made from buckwheat? ie; are they gluten free? Hope you’ve trained those munchkins to deliver breakfast in bed!! They’re actually a wheat/buckwheat blend, so no, not gluten free, but you could easily use rice noodles in this. I love a rice noodle!